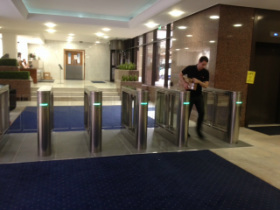 Ursa Gates completed an installation of gates into the Student Loans Building in Glasgow's Bothwell St. There are over 1500 employees working in the building so we needed to ensure that the fire log was 100% accurate. 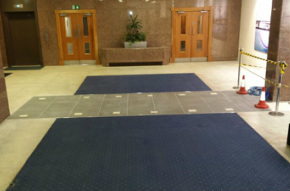 After surveying the entrance it was clear we could fit 5 bi-direction lanes including a wide 900mm lane for disabled access. 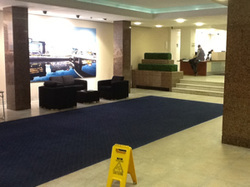 Due to the floor being marble tiles we had to plan our preparation work very well. We lifted a section of the existing floor to enable us to install the cabling conduit and re-tiled the floor to a design instructed by the client. Over the course of a weekend we had managed to bolt all our paddle gates into position and began to wire them. 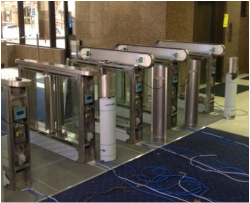 Each lane was controlled on exit and entry by means of a proximity card ensuring that the system knew exactly who was in the building and any give time. After conducting the final commissioning and fire test (gates are open in the event of a fire) we were finally ready to hand over to the client. The gates are operating over 5000 times a day.